I remember myself as young kiddo eagerly handing out homemade invitations to my friends on the playground and dance, helping my mom bake cupcakes in ice cream cones (because they seemed fancy), blowing up balloons, and hanging Pin-The-Tail-On-The-Donkey on the living room wall. At-home parties were the norm because out of necessity and fun. Fast forward a few decades. 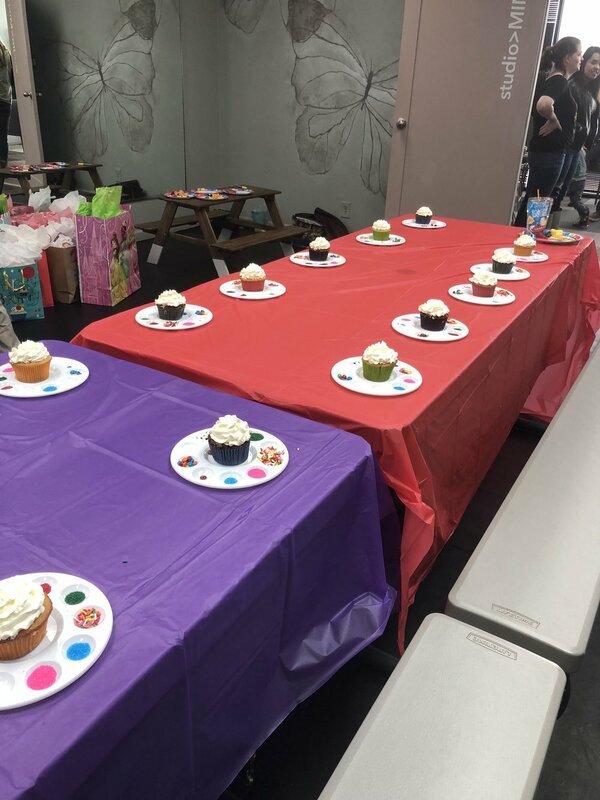 I’m now a mom, and birthdays seem to have morphed into expensive productions so grand that I feel like I need to take out a loan and hire a party planner to meet expectations. So, when E asked for a craft or art party this year, I decided that I was going back to my old-school DIY days and throw her an epic 4th birthday bash (on a budget). It’s simply not an art party without an artsy invite (and a cheap one at that). I got this idea from Pinterest and it cost me $1.99 (the cost of the brads). E and I just waltzed into Lowe’s and I let her go to town picking out paint samples in an array of colors. Then I printed out the actual text onto mailing labels we already had. My husband used his steady hand to print on the front and then we just attached the two pieces with colorful brads I picked up at Michael’s. I got so many compliments on the invites and it took us all of 30 minutes to make them. One of my biggest considerations was yummy, mostly healthy food that would satisfy picky kiddos. I opted for some Chick-fil-a nuggets because, well it was easy and all the kiddos (and adults love them). Then we did some fruit, E’s favorite and colorful Annie’s Bunny Snacks and Goldfish. I’m not exactly a standout baker, so I happily outsourced to my favorite baker and good friend Tiffany. She has made all my cakes including our wedding cakes, so she is my go-to. We did half chocolate and half vanilla and just plain white icing and let the kiddos do the rest. I got these cute mini palettes on Amazon and filled then with a rainbow of colored sugar and confetti sprinkles. These palettes were less than a dollar each and because they’re plastic, I sent them home! For the tabletop, I spent some DIY time prior to the party crafting simple, affordable items to suit the theme. I raided my local dollar store for tablecloths, plates, and simple colorful decor. I ordered some canvas matte boards from Amazon and brought E’s paints for the kiddos to make their own art. We set out paint, crayons, markers, stickers, glitter and let them go to town! I also ordered these cute colorful paint aprons to keep any mess down and protect clothing and served as another taken home. The best part about the table decorations: after the kids were done crafting, the tablecloth and eaten off the paper plates, everything was folded up and placed neatly into the trash! After the kiddos painted, they had dance party! The dance studio was great for this. We just turned on some music and the kids danced and jived until it was time for cake. It was so much fun and even some of the mamas got in on the action. E had an absolute blast and the best part, I spent way less than I have in the past! 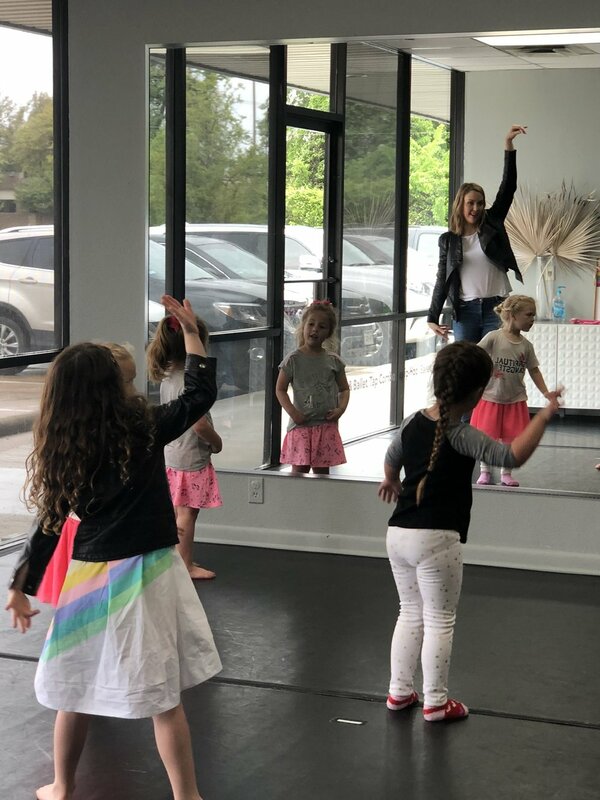 I was fortunate to be able to host the party at the dance studio and they do such a great job! 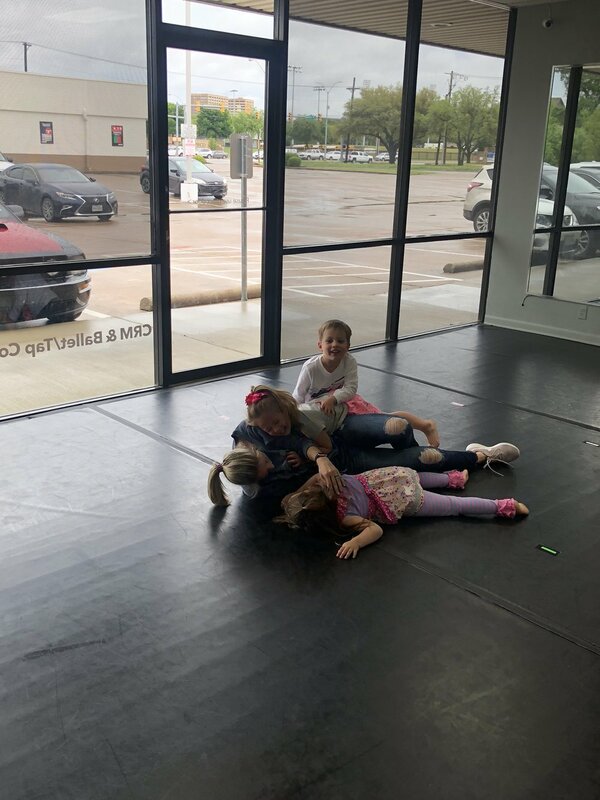 If you’re in Fort Worth and need an awesome place to host a birthday bash, check out Studio of MoveMINT. *Linking up with Lindsay’s Sweet World for Hello Monday.